collapsing into a stream / the doors open to the rain." What burst forth is a festival of betrayal. I make it tell the body profit. He excuses himself / uncontrollably. as the dead / I often have singing / sung thoughts that can only occur / as the undying. up with a collection of vignettes in which women give each other fruit." -What does it mean to repeat myself? The first page of this poem contains quotes from my first book, The Pulp vs. The Throne (Artifice Books). -Thank you again Ella Longpre, especially, for writing the quotes used in this poem. Thank you. The quotes that appear are from the essay, "The Event Vanishes," which was published at Fanzine on November 22,2016. -I listened to the song, "In The Morning I'll Be Better," by Tennis. -"Art is Medicine: Helen Molesworth on the Work of Simone Leigh" was published by ArtForum and written by Helen Molesworth. -There are quotes from a public FB post he made, from a cease and desist letter he sent that was posted online, and Cassandra Troyan said "There's nothing more feminist…" on her FB wall. 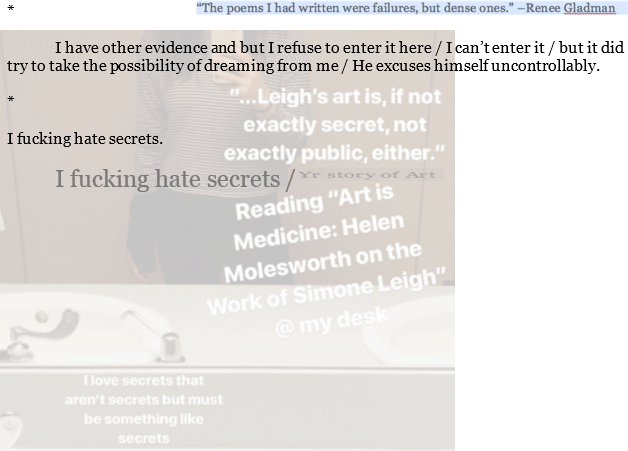 -There are excerpts from the LOR he wrote that I opened and then burned. 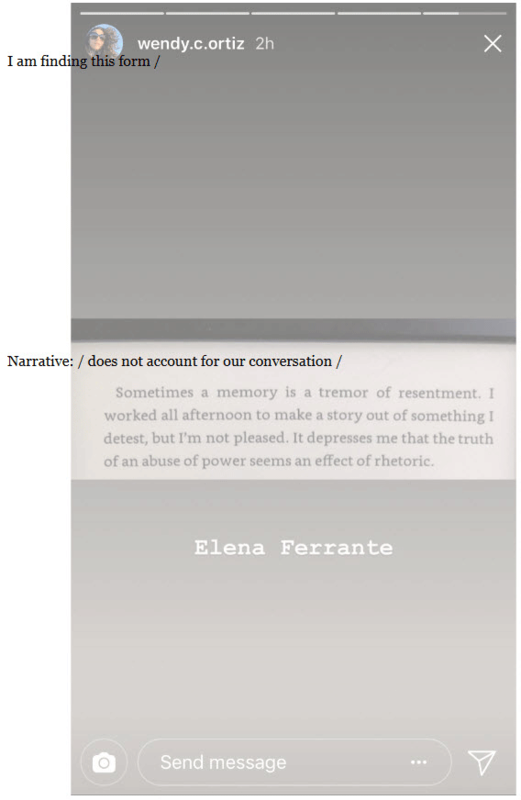 -Thank you Wendy C. Ortiz for allowing me to take a screenshot of your Instagram story, which features a quote from Elena Ferrante's Frantumaglia. 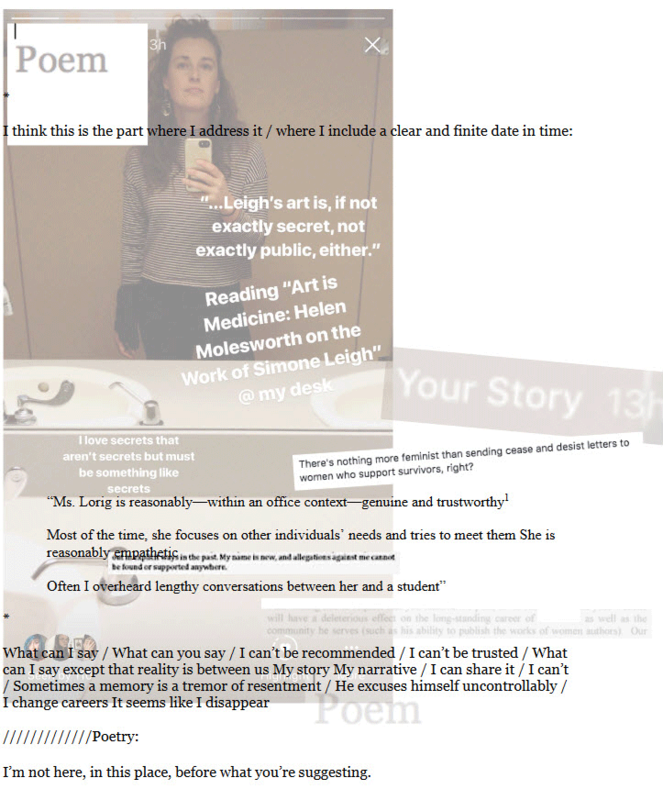 Carrie Lorig is the author of The Pulp vs. The Throne (Artifice Books, 2015). Chapbooks include The Blood Barn (Forthcoming 2019, Inside the Castle), The Book of Repulsive Women (Essay Press), Reading as Wildflower Activist, and NODS (Magic Helicopter Press). She lives in ATL.